The blend of two different technologies PET and MRI has brought remarkable results in cancer diagnosis. The PET/MRI scan fuses anatomic images from the MRI and functional information from the PET scan to create a high-resolution diagnostic tool. Researchers at University Hospitals Case Medical Center (Cleveland, OH, USA), in collaboration with researchers from Philips Healthcare (Eindhoven,The Netherlands) examined 145 cancer patients with a double-scanning protocol of Positron Emission Tomography (PET)/ Computerized tomography (CT) followed by a PET/ Magnetic Resonance Imaging (MRI) performed on the Philips Ingenuity TF PET/MRI system, which brings together the complementary capabilities of both to better visualize both functional and anatomical information, and to superimpose this information in a combined digital image. The relative strengths and weaknesses of the two modalities are complementary, which makes each of them compensate the limitations of the other. This would be a new hybrid imaging modality which evolves as a synergy to better understand both the anatomical and functional details. The technology fuses the images to more precisely pinpoint cancer locations and improve the accuracy of disease staging. 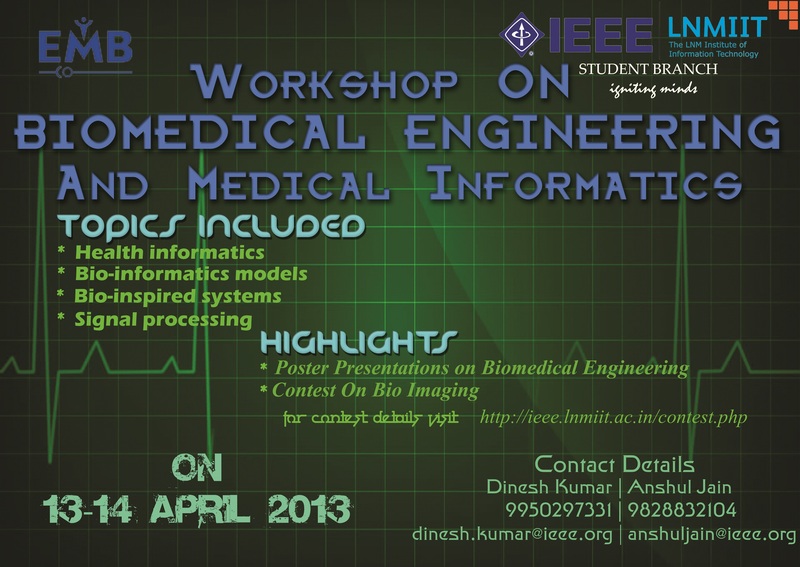 “Workshop on Biomedical Engineering and Medical Informatics ” at LNMIIT, Jaipur on 13th and 14th April 2013 and cordially invite you to be a part of the same. The workshop shall focus on topics like Bio-devices and Medical Instrumentation , Health Informatics, Bioinformatics Models, Methods and Algorithms and Bio-inspired Systems and Signal Processing. The committee is also organizing a contest on Bio-medical Imaging, which aims at finding efficient and faster algorithms to segment the cells in Breast Cancer Images. Department of Medical Electronics, B M S College of Engineering, Bangalore, India is organizing two days “INTERNATIONAL SYMPOSIUM ON MEDICAL ELECTRONICS 2013” ISME’13 on 30th & 31st JANUARY 2013 for the benefits of Faculty members, Research Scholars, PG and UG Students in Engineering Colleges /research institute to share and learn the innovative techniques to enrich their knowledge. The major resource person is from Japan and will deal with Hand-on sessions as well. Please note that the Symposium is limited for few participants on first come first serve basis. So hurry up and register.